Ramblings of an SL Shopaholic: Let's Get Lost. Well I don't know where I'll go now, and I don't really care who follows me here. But I'll burn every bridge that I cross, and find some beautiful place to get lost. Sometimes, really, is funny how music speaks to you. Or your character, for that fact. Hard to explain, but I guess that's the mood of the day, and it's passing over to my blog. Oh noes! At any rate, it kind of fits the picture.. crossing and burning bridges, to get to a beautiful place. But.. if you are going to cross a bridge, you have to do it in style. Yes! Normally, I'm not one for pastels, I find they wash out the skin, and make you look too.. kiddish, however, it's Easter time, or close to it, so.. in the spirit of Easter, on to show off some pastels, and this little number by limited bazaar is perfect! They have one in blue, and another in purple, I decided to go pinkish because.. I rarely do, I love the small embroidered detail on it.. or structural detail I guess you could call it. I only wish it was slightly mapped out on the actual dress, instead of just drawn, so you could have a lot more dimension on the dress, as of right now.. unless you cam very very close.. it kind of gets lost in the dress. However, still adorable. 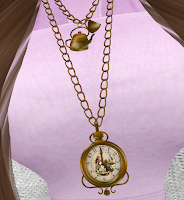 In more Limited Bazaar news, this cute little jewelry set is actually Alice in Wonderland themed. And.. well, i'm going to admit. I'm a sucker for anything Disney.. so.. of course I had to rush and get it! 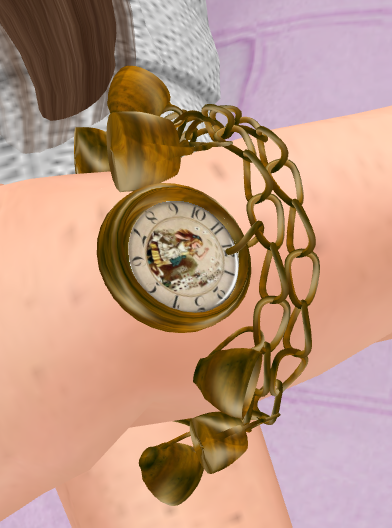 I loved the aged feel to it, very vintage style, and the cute little picture on the watch. Totally had to have it, and it's limited, so rush and get it guys! I paired it off with a cardigan from TokiD, because.. well, layering.. always helps create the outfit, and give it a you flair, and some Gos boutique shoes.. because.. I'm totally in love with TokiD. The hair is from Exile, and found it really gave a feel of innocence and effortless to the outfit.